Ugh I hate when it’s cold and dreary on a day when I planned to be outside. It’s horrible and bums me out until I find something to do. The only plus side is that when I’m bored, I often come up with the coolest recipes. 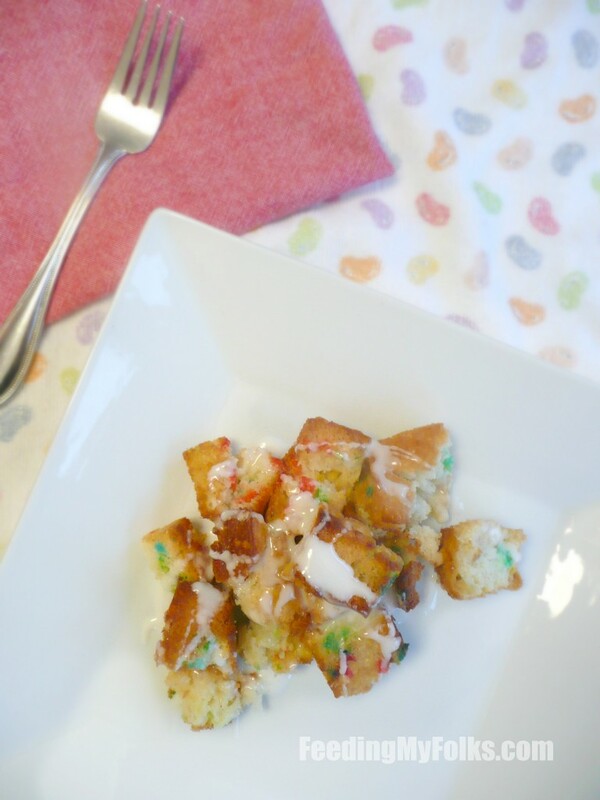 Like yesterday when I came up with a bread pudding recipe out of funfetti cake. That’s right, I transformed everyone’s favorite childhood cake mix into an easy dessert that made my family think I’m incredibly creative. Ego boost and delicious dessert? Win! 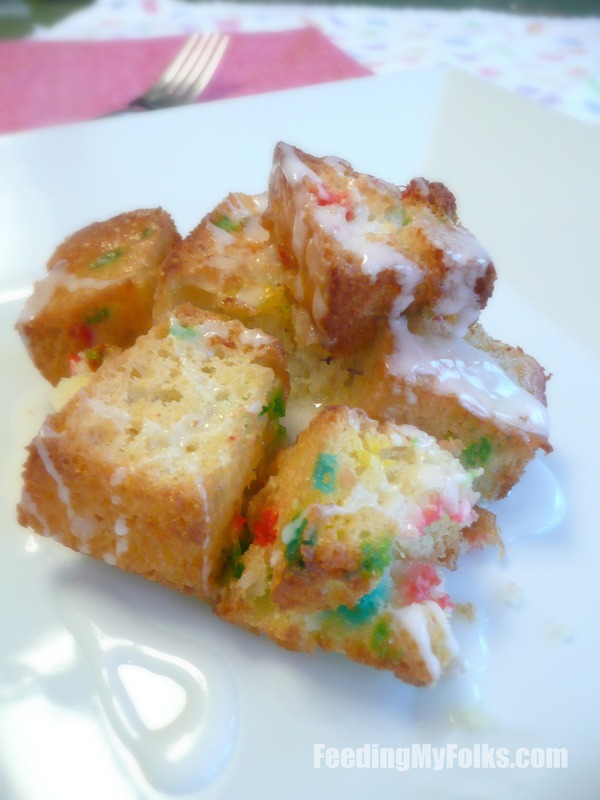 So let me explain what you gotta do: A simple box of Funfetti cake mix is whipped up, baked, and cut into cubes. Those cubes are popped back into the oven to make “cake croutons” (totally coining that idea). When they’re all crispy, drizzle over a simple custard mixture, let it soak, then back in the oven. That’s it. The boxed cake basically did all the prep for you! Thank you cake company people, you made my blah day less of a hassle! Anyway, the little sprinkles of blue and red are an awesome way to brighten up a rainy day. For lack of a better phrase, this recipe totally turned my frown upside down! After binging on this bread pudding, I texted my friend “Cake….coma…” before passing out into a deliciously satisfied food coma. Despite it’s brevity, it was a pretty insightful text about the effects of this Funfetti bread pudding. This recipe is so tasty that you’re guaranteed to eat more then you planned, thus flinging you in a major food coma. Heed this warning – do not make this cake pudding if you have issues with portion control…you will not be able to control yourself! But for those cooks who are brave (or hungry) enough to take on that warning, make this bread pudding, and meet me on the couch where I’ll be relaxing with unbuttoned pants! Prepare the Funfetti cake mix as per the directions on your box (the brand I used said to mix together cake mix, 3 eggs, 1/3 c vegetable oil, and 1 cup water…then pour into a greased pan). Bake in preheated oven for 30 minutes. Cool slightly before slicing the cake into cubes. Put the cubes onto a baking sheet and bake for 15 minutes, remove from oven, and flip each cube. Put back into the oven to bake for 15 minutes more, or until all the cubes are toasted. 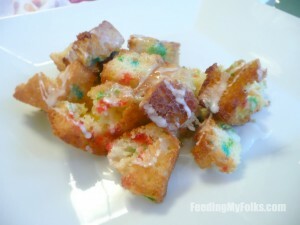 Take the “cake croutons” and put into a casserole dish (I ripped apart a bunch of them, and kept the rest in cubes) . In bowl, whisk together melted butter, sugar, and eggs. Whisk in milk, vanilla, and a pinch of salt. Pour this mixture over the toasted cake. Let it soak/absorb for 10 minutes before putting back into the oven to bake for 30 minutes. Drizzle with glaze (below) and serve. Enjoy! Whisk together powdered sugar and milk until smooth. Drizzle over bread pudding. I just made this and it was really good! Really sweet, but good. Thanks!